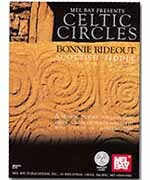 Inspired by the Celtic circles of ancient Scotland, Bonnie paints a musical picture through time, joining the heavens and earth to the cycles of everyday life. Performed on Scottish fiddle with gold medal piper Eric Rigler on the Great Highland bagpipe, Scottish smallpipes and uilleann pipes. Also accompanied by guitar, Celtic harp, viola da gamba, hammered dulcimer, bass and bodhran. Includes North Highland tunes from The Patrick McDonald Collection, 1784, pipe marches, strathspeys, jigs and reels, laments and traditional favorites.